Why we use REAL chocolate. 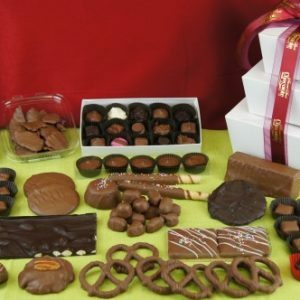 This Gift Pack 3 includes a 15 piece assorted chocolate box, chocolate covered potato chips, 5 pack of peanut butter bites, 2 graham crackers, 2 chocolate covered oreos, 6 milk chocolate mint meltaways, 6 milk chocolate caramels and a 6 pack of milk chocolate pretzels. This assortment comes packaged in a white box with ribbon. Can be added to Gift Pack 1 and/or 2 to make a Gift Pack Stack. 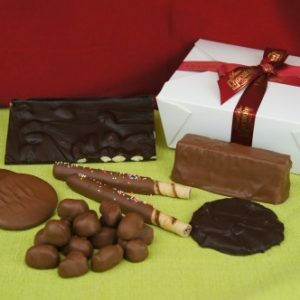 This Gift Pack 2 includes a dark chocolate almond bark, marshmallow brick, two chocolate covered hazel nut sticks, two peanut butter patties, a dark chocolate mint patty and a package of chocolate covered jujubes. This assortment comes packaged in a white box with ribbon. Can be added to Gift Pack 1 and/or 3 to make a Gift Pack Stack. 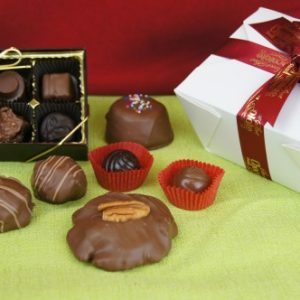 This Gift Pack 1 includes a chocolate covered brownie, 4 piece assorted chocolates, a milk and a dark chocolate cherry with a creamy center, 2 peanut butter balls and a caramel pecan crown. This assortment comes packaged in a white box with ribbon. Can be added to Gift Pack 2 and/or 3 to make a Gift Pack Stack. A Combination of Gift Pack 1, 2, and 3, this Stack will sure to please. It includes a 15 piece assorted chocolate box, chocolate covered potato chips, 5 pack of peanut butter bites, 2 graham crackers, 2 chocolate covered oreos, 6 milk chocolate mint meltaways, 6 milk chocolate caramels, a 6 pack of milk chocolate pretzels, a dark chocolate almond bark, marshmallow brick, two chocolate covered hazel nut sticks, two peanut butter patties, a dark chocolate mint patty, a package of chocolate covered jujubes, chocolate covered brownie, 4 piece assorted chocolates, a milk and a dark chocolate cherry with a creamy center, 2 peanut butter balls and a caramel pecan crown. 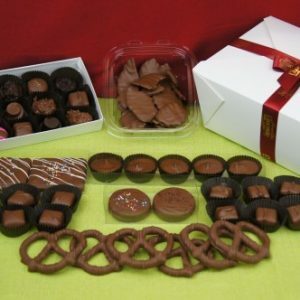 This assortment comes packaged in a white box, stacked with ribbon.